Owners of Tecno mobile might have detected some imitations of their products in the market or better still just trying to prevent possible risk of having fake tecno products around by providing an online platform where prospective or current users of tecno mobile can quickly check the genuineness of that Tecno phone before buying it and if you already have one, you may just check for the sake of assurance. Here's how you can check for original tecno battery or phone. 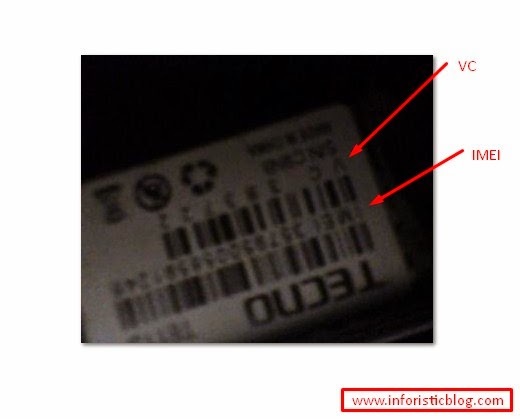 To determine a genuine tecno mobile, get the serial number and VC number of the phone by removing the battery to check for the label at the battery house or check the label at the body of the pack. When the page is done loading, input your IMEI and VC number like in the picture below then click submit. You should get a response that says 'welcome' and if it's fake, you will be told that the VC number does not exist. If the Tecno battery is an original battery, you would get a response saying "original tecno battery" and if it is fake you will get otherwise. I hope this was helpful, kindly take few seconds to share this with your friends by using any of the share buttons and if you have any comments regards this post, please use the comment box. Cheers!